2CHYP has a 7.57% dividend yield, which is double that of the REIT index. 2CHYP's dividends are supported by ample cash flow with an FFO payout ratio of 67.8%. Higher cash flows fund bigger dividends while leaving capital for growth. This is the value engine that makes 2CHYP work. 2CHYP, our high-yield REIT portfolio, commenced trading on 7/1/16, making this our 11th quarterly update. It is actively managed with an aim to maximize total returns. We firmly believe that active stock selection and diligent trading can generate higher returns over the long run. There are many principles driving the asset selection that goes into our 2CHYP portfolio, but this update will focus attention on the concept of buying assets for far less than they are worth. Let us begin by digging into this concept and follow with details and analytics of the full 2CHYP portfolio heading into the 2nd quarter. Assets have value, and I think just about every market participant would agree on a rough methodology for calculating the value of assets. The value of an asset is related to some combination of the magnitude of future cash flow the asset generates and the cost of replacing the asset. There is some subjectivity as future cash flows are uncertain, so rather than an exact number, the value of an asset can better be described as a range. Different analysts with different outlooks will come up with different numbers, but generally, their estimates will all fall within a fairly tight range. Thus, I would posit that valuing a single asset is more science than art. It merely has error bars to account for different judgments as to what the future holds. Valuing a stock, however, seems to be a very different process. Rather than a tight range of values, market participants come up with wildly different estimates of value. There is far more emotion involved in valuing a stock, and I believe the origin of the emotion is the market price. It is human nature to use price to discern fundamentals. When a stock drops 30%, there must be something wrong with it, and when it rises, the company must be firing on all cylinders. In recent quarters, this read-through has been particularly potent as the expensive stocks have gotten more expensive, and the cheap have gotten cheaper despite no clear divergence in the underlying fundamentals. REITs consist of collections of individual assets, and I believe they can be valued by summing the value of the individual assets. This process removes the emotions injected by stock price fluctuations and preserves the more scientific asset value approach. Market prices are subject to emotion and fluctuate rapidly, while asset values are based on underlying fundamentals and are quite steady. In the long run, market prices will trend toward asset value, but at any given point in time, there can be huge disparities between the two. I believe a massive opportunity lies in capturing the disparity. The optimal time to buy is the point of greatest negative divergence in market price as compared to underlying asset value. Clearly, we can only know the exact time in hindsight, but at any given time, we can measure how large the disparity is. When an asset is bought at a large discount to underlying value, it is likely going to generate a strong return even if the bottom is not timed precisely. Where can one find the biggest discounts to asset value? Since market price is heavily influenced by sentiment and emotion, the greatest discounts are often in stocks with low market sentiment. This means we often buy stocks that are beaten up and disliked by a majority of market participants. Clearly, some stocks are cheap for a reason, so the key to this style of investment is to buy stocks that are unfairly discounted or where the magnitude of discount exceeds that which is warranted by the underlying weakness. For some time, there has been a sizable gap between public and private valuations of properties, with the public REITs trading at cap rates as much as 200 basis points higher (cheaper) than the cap rates of their underlying properties. This gap was largely caused by the market anticipating that cap rates would rise due to what was widely believed to be a rising rate environment. Thus, when a hotel REIT was trading at an 8% cap and its upper-upscale properties were trading at 6% caps in the private market, investors were signaling that they believed private market cap rates would rise to 8%. In other words, they thought private property valuations would drop to meet the pricing of public REITs. However, it now appears that market prices will have to move to NAV rather than the other way around. Macroeconomic expectations have done a full 180. It seems like, overnight, we have gone from a rising rate environment to a falling and possibly long-term low-rate environment. 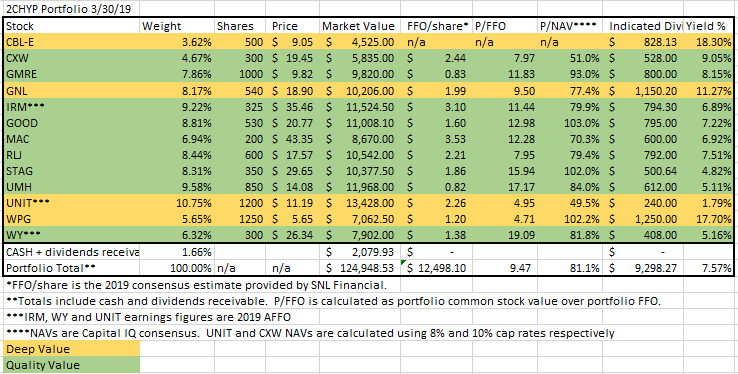 I believe there will be a gravity pulling REIT market prices up toward NAV now that it looks like cap rates are stable or possibly even headed lower due to the influx of foreign capital. For the average REIT, this is good news as the mean and median REIT trade at discounts of 4.7% and 6.8%, respectively. It is much better news for the REITs trading at massive discounts. This is where careful asset selection comes in. The stocks in 2CHYP trade at far larger discounts to NAV with an average price to NAV of 81%. Without further ado, here is the 2CHYP portfolio heading into the 2nd quarter. Let us start by analyzing the portfolio as a whole, then we will move on to each individual security. We are active managers, trading frequently and holding active weights that differ substantially from the index. Despite this being a 100% REIT portfolio, it looks nothing like the REIT index, and we think it is far better positioned. Here is how it stacks up. 2CHYP’s 7.57% dividend yield is fully double that of the REIT index, and it is better supported by FFO with a lower payout ratio (67.8% vs 76.7%). This is accomplished through selecting securities with high cash flow relative to market price as measured by a P/FFO of 9.47X, which is less than half the multiple of the REIT index. For every dollar of cash flow an investment in the REIT index generates, an investment in the 2CHYP portfolio generates $2.14. More cash flows support bigger dividends while still leaving capital for growth. Relative to the REIT index, we are substantially underweight office and apartments with overweights in manufactured housing, timber, and corrections. These over and under-weightings are intentional. Office in the U.S. continues to be plagued by oversupply with further anticipated deliveries in 2019. Vacancy rates are already in the double digits, and I think they are going to get worse. The office exposure we do have is protected from this weakness in 2 key ways. Much of GNL’s offices are in Europe where office fundamentals look far healthier. Long duration, triple-net leases with high credit tenants lock in GNL’s cash flows. Apartment fundamentals look okay, but stock prices in the sector are quite high, and rental rates are already high relative to household income such that further rate increases will be challenging. We see manufactured housing as the better residential play with current rental rates being far more affordable, leaving more room for growth. Timber and corrections are great diversifiers that are virtually non-existent in the REIT index. Corrections is counter-cyclical, providing downturn protection, and timber continues to grow during recessions. While 2CHYP clearly holds fewer securities than the REIT index, I believe our diversification among economic exposures provides superior protection from a downturn. Being in the right sectors is important, but we are bottom-up analysts at heart. Our primary focus is on picking the individual stocks that are best positioned to outperform. The industrial REIT sector has well-known tailwinds and is generally regarded as a growth sector. As a result, a majority of the stocks are fully valued or even overvalued. STAG Industrial (STAG) has full exposure to the growth but comes at a more reasonable price tag. It is discounted to peers based on its focus on class B industrial in secondary markets. The market is looking at this from too wide of a lens. It is true that, in most real estate classes, trophy properties in tier 1 markets are more stable, but that is not the case with industrial assets. Class B properties substantially outperformed the super-premium industrial facilities through the financial crisis. The cash flows are historically more steady, and the tenants are stickier. In owning STAG, we are simultaneously getting higher cash flows due to the discount at which it trades and what I believe will be greater stability. Gladstone Commercial (GOOD) is a backdoor way to invest in industrial REITs. It is broadly regarded as a triple net REIT and is therefore not priced with the premium that comes with industrial REITs. Fundamentally, however, its exposure is largely industrial. It acquires and owns industrial properties and simply structures them with long-term triple net leases to their tenants. The Gladstone team has a unique ability to assess the creditworthiness of non-rated tenants, which has 2 benefits. Non-rated tenants pay more rent. GOOD can obtain tenants of very high credit that are not known by competitors to be of high credit. It is largely this underwriting of tenant credit process that allowed GOOD to maintain its dividend through the entirety of the financial crisis. Tenants stayed and paid rent on time and in full. Retail REITs are a challenging place to invest. There are real headwinds to the sector and additional perceived headwinds that go beyond the reality. The market seems to have separated retail REITs into 2 buckets; Malls and Not-Malls, with the malls receiving the brunt of the market’s collective fears and admonishment. We believe this is a false dichotomy. The headwinds are being overlooked in free standing retail and shopping centers which are fundamentally just as susceptible, and the fears are overblown when it comes to malls. The perceived disparity of risk has created a massive rift in valuations between malls and not-malls in which I believe the malls have become opportunistically cheap. Between the 3 mall REITs in 2CHYP, I believe we have optimized our exposure across the spectrum. CBL Properties (CBL) sits at the low end in terms of sales per foot and general property quality. It is a deep value play, with the stock priced for a high likelihood of total failure. It is often viewed as a binary outcome of turnaround play or wipeout, but I think there is a middle ground that is far more likely. I don’t think CBL will turn it around and become a thriving company. Instead, I think its better assets will stabilize, and its worse assets will be sold. The magnitude of the proceeds from asset sales, combined with the value of the stabilized properties is essentially what CBL is worth. Depending what cap rates the assets are sold at and the magnitude of NOI decline before stabilization, CBL common could be worth $0, or it could be worth as much as a triple from today’s price. It is a high-risk, high-reward kind of play. The preferred is substantially lower risk as the cap rates on asset sales would have to be extreme before the preferred starts to lose value. I see such an outcome as rather unlikely. Preferreds are often regarded as having lower reward since they have a fixed par value, so I think the market is viewing CBL-E as moderate risk and moderate reward tied to the 18% dividend yield. However, preferred math gets more interesting when there are severe discounts involved. While trading at about $9 a share, CBL-E still has a $25 par value and is entitled to this full amount subject to the standard waterfall. If CBL is bought out, the preferred owners likely get $25, and if CBL stabilizes, even in a dramatically weakened state, the preferreds will eventually get $25 plus the dividends. Even in a liquidation scenario, the recovery for preferreds looks better than 36%, which is all that is required for those buying at today’s price to be made whole. Things could go wrong, but CBL-E has potential for 175% upside plus dividends in all but the worst scenarios, which I believe results in a favorable reward to risk ratio. Washington Prime Group (WPG) is well positioned for a full turnaround and is in roughly the 8th inning. It was early to notice changing consumer preferences and was among the first mall REITs to focus on lifestyle tenancy. WPG incented its leasing agents to bring in gyms, restaurants, and other experiential tenancy, which preserved the foot traffic at WPG malls. In fact, WPG’s sales per square foot have actually increased during the hard times for retail. Its NOI declines have been largely the result of asset sales, and now that the culling is nearly complete, WPG is guiding for positive NOI same-store growth in 2020. At a multiple of less than 5X FFO, I believe there is tremendous upside if this positive growth can be demonstrated. Even flat NOI would be better than what is represented in the stock price. It is a rare opportunity to buy trophy assets at value asset prices, and Macerich (MAC) is just that. MAC fell from over $90 a share to just over $43 with almost no fundamental harm. Sales per square foot have risen dramatically, now cresting the $700 mark. These are premier malls in ideal locations, and tenants want to have presence in them. There is nothing all that clever about our MAC position. It is simply great assets available at a massive discount to their value. Tech-related REIT assets are exciting. They have the growth potential of the tech sector with the cash flows of real estate. Most trade at high multiples, and that is probably correct. Uniti Group (UNIT) owns a large portfolio of fiber supplemented by cell towers, making it the gatekeeper to the buildout of 5G. UNIT already has achieved substantial leasing of its fiber, which is responsible for its $2.26 of AFFO per share, but it has far more capacity to lease out. With a utilization rate below 30%, UNIT can take on many more tenants without much incremental expense. As 5G picks up steam, the small cells will need fiber backhaul, and Uniti has the dominant fiber network in its submarkets. This is an exciting growth story, so why does UNIT trade at only 5X AFFO while other tech REITs trade at 20X? The answer is Windstream’s bankruptcy filing. As most of you already know, Windstream is a major tenant for UNIT, and its chapter 11 bankruptcy gives it the opportunity to reject its lease with UNIT. If WIN were to reject the lease, UNIT would suffer materially until it found a replacement tenant. Much of UNIT’s investor base came from its spinoff from Windstream, which is firmly in the telecom world. These investors have different skillsets and knowledge bases than REIT investors and, as such, are likely not as familiar with how ironclad REIT master leases can be. I believe this lack of REIT familiarity caused them to view lease rejection or forced renegotiation as a moderate or high probability. Fear of this outcome has driven UNIT’s stock price down to a mere fraction of its fundamental value. I find rejection to be quite unlikely because of 3 simple factors. The master lease must be accepted or rejected in full per critical vendor rules in chapter 11 bankruptcy. This seemingly eliminates the possibility of a forced renegotiation. Windstream derives a majority of its revenue from the use of UNIT’s assets and, as such, must pay their rent to continue generating revenue. Basic telephone and internet services are considered a safety net, and the FCC will enforce that these services are provided. We see it as likely that the FCC would prevent lease rejection even if WIN wanted to. In addition to these factors, I think the most telling sign is that Windstream has paid its rent to UNIT on time and in full AFTER declaring bankruptcy. If I am right about the lease being upheld, Windstream will be a much stronger tenant coming out of bankruptcy with less debt. UNIT’s cash flows would once again be viewed as stable and its multiple would have sizable room for expansion from 5X to growth REIT multiples closer to 20X. I don’t think it will get to 20X any time soon, but 10X to 15X is reasonable in the near to medium term. UMH Properties (UMH) is the only REIT pure-play on manufactured housing (MH) as the other MH REITs have substantial exposure to RV parks. I do not like the fundamentals of RV parks as they rely on continued demand for the RV lifestyle, which is subject to cultural trends and preferences which are unanalyzable. RV parks may do well, but I have no means of discerning their future. A much more reliable trend is that people will always need to live somewhere and manufactured housing provides an excellent value proposition for the customer. UMH specializes in acquiring MH communities and turning them into places where people want to live. They have a long-established track record of sizable occupancy and rent gains under their ownership. Data security is of increasing importance in a world with dwindling levels of privacy. While the Facebooks of the world are collecting and selling our data, Iron Mountain (IRM) is there to protect it. IRM is the global leader in secure storage of physical data and is quickly becoming the global leader in storage and protection of digital data. IRM trades at a low multiple because people are worried about potential churn in its physical storage business - churn which has yet to manifest. I don’t think the churn will happen because of IRM’s stalwart reputation for security. When individuals and businesses need sensitive information protected, they do not view this as a time to go bargain hunting, they go with the trusted provider that has been protecting their data for decades. In the event IRM’s customers no longer need physical paper storage, IRM now has the capability to execute a transfer to digital. Rather than churn, I think it will be more of a transition to digital, and this new business line is higher margin. Hotel earnings growth has been hampered by rising labor costs, which are eating into margins. RLJ Lodging (RLJ) is countering this headwind with share buybacks and dispositions at high prices, allowing it to maintain earnings better than peers. RLJ has one of the best management teams among hotels, yet it trades at one of the lowest EV/EBITDA multiples. We view this as clear mispricing. Yes, Global Net Lease (GNL) is externally managed by affiliates of American Realty which has a poor track record. There is a limit, however, to how much discount should be associated with external management. 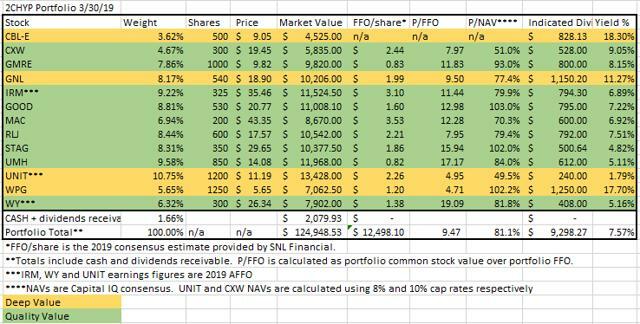 GNL is trading at half the P/FFO and double the dividend yield of close NNN peers. I think that magnitude of discount is excessive, given the lower level of importance of management in NNN relative to other more management intensive property types. NNN real estate with long weighted average remaining leases requires very little attention from management. I don’t think the external manager will be adding any sort of value here, but due to the contractual nature of revenues, they don’t need to. GNL is simply an oversized stream of reliable cash flow backed up by high credit quality tenants. Global Medical REIT (GMRE) is a play on medical office that is not yet trading at medical office multiples. Peers such as Physicians Realty Trust (NYSE:DOC) and Healthcare Trust of America (NYSE:HTA) quickly rose to high FFO multiples, and deservedly so as this property type is arguably the most fundamentally stable among healthcare properties. GMRE has already received some multiple expansion, and I think there is more to come. They recently issued equity accretively with high cap rate property acquisitions lined up to use the capital. As their market cap grows, the multiple will grow with it. Core Civic (CXW) is being held down by a recent swell in socially conscious investing which has featured major companies pulling away from private prisons. Various state pension funds have sold their shares to assuage their guilt or at least clear their reputations in the eyes of the social movement. JPMorgan (NYSE:JPM) declared that it would no longer lend to the private prison industry. While such actions have been substantial headwinds to market prices, they do not actually impact fundamental value, which is far above market prices. Further, they provide room for a bounce-back as sentiment normalizes. Core Civic is rapidly growing its state level contracts which improve its cash flow and diversify its revenue sources. We see significant FFO/share growth and further dividend increases over the coming quarters and years. I want to be clear that I am not advocating a moral stance on the private prison industry. There are strong arguments on both sides as conditions in private prisons can be bad, but they can be just as bad in publicly run prisons. It is an ugly area, and there seems to be no great solutions. My job as a fiduciary is not to make moral judgments but to make money for my clients, so my ownership of CXW is strictly the result of financial analysis, which suggests it is positioned to outperform. Timber as an asset class has been subject to wild swings in investor interest. In recent quarters, timber REITs have fallen dramatically as a period of low investor interest coincided with falling lumber prices. This created an opportunity to get into Weyerhaeuser (WY) at a sizable discount to the value of the land it owns. This is a desirable asset class that normally trades at a 4% yield but is currently above 5%. 3 characteristics make timber a great long-term investment. Timber cash flows are uncorrelated with other equity investments. 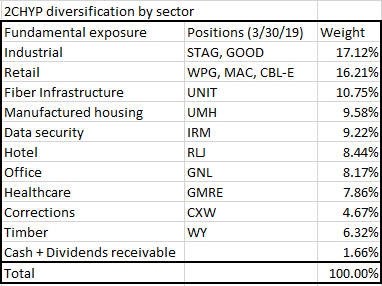 The downside of timber REITs historically is that they have been low on current cash flow, but thanks to the sizable price drop, cash flow yields are strong. 2CHYP returned 13.1% in the first quarter of 2019, which sounds like a great return, but it is actually underperformance in the quarter, given that REITs, as measured by the MSCI US REIT index (RMS), returned 16.27% in 1Q19. 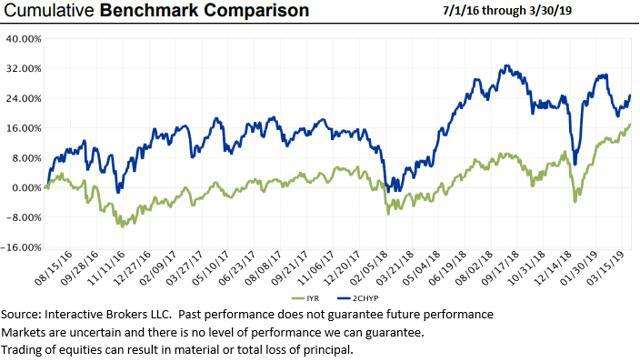 Over the 11 quarters since inception, 2CHYP has accumulated moderate outperformance, returning 24.95% as compared to 11.39% for the RMS and 16.90% for the iShares U.S. Real Estate ETF (IYR). We are not satisfied with this modest margin of outperformance and aim to do better going forward. There has been a long-standing headwind of value being out of favor, and small caps have also been out of favor. Value versus growth and small versus large market preferences are cyclical in nature and, eventually, will become tailwinds for our small-cap value portfolio. Until that time, the market’s distaste for value is providing us with highly opportunistic entry points with the average stock in 2CHYP trading at just 81% of the value of its assets. The holdings presented were the entire holdings of 2CHYP as of 3/30/19 but may not represent the holdings for other time periods. We do not intend presentation of 2CHYP’s holdings as a recommendation, but rather as a statement of historical fact. We cannot determine whether the portfolio holdings presented are suitable for any given reader. Readers are encouraged to contact their financial professional to discuss the suitability of any strategies or holdings prior to implementation in their portfolio. The specific securities identified and described herein do not represent all of the securities purchased or sold for advisory clients of 2nd Market Capital Advisory Corporation (2MCAC). It should not be assumed that investments in the securities identified and described were or will be profitable. A list of all prior purchases and sales made by the investment advisor representative (Dane Bowler) in the 2CHYP portfolio is available upon request. It should not be assumed that purchases and sales made in the future will be profitable or will equal the performance of the securities in this list. Benchmark Comparison: 2CHYP portfolio is compared to the iShares REIT ETF (IYR) which is 2CHYP’s stated benchmark. We also compare it to the MSCI US REIT total return index (RMS) because it represents market weighted performance of the REIT universe in a portfolio of REITs, and we view these as competitors or alternatives to 2CHYP. IYR has fees that are factored into performance, while 2CHYP does not have a fee aside from trading commissions which are factored into performance. 2CHYP’s dividends are reinvested, while IYR’s dividends are paid but not reinvested. Strategy and market conditions: 2CHYP uses a bottom-up stock selection process, which may fare better in certain market conditions than in others. It may perform better when value is in favor or worse when value is out of favor. Expenses: Returns reflect the deduction of any transaction expenses. There are no costs or management fees charged nor deducted. Past performance does not guarantee future results. Investing in publicly held securities is speculative and involves risk, including the possible loss of principal. Historical returns should not be used as the primary basis for investment decisions. Although the statements of fact and data in this article have been obtained from sources believed to be reliable, 2MCAC does not guarantee their accuracy, and assumes no liability or responsibility for any omissions/errors. Calculation Methodology: Partial year return for the period 7/1/16 through 3/30/19, unaudited. 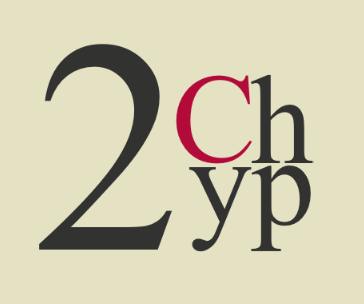 Dividends in 2CHYP are reinvested. 2nd Market Capital and its affiliated accounts are long CBL-E, CBL, CXW, GMRE, GNL, GOOD, IRM, MAC, RLJ, STAG, UMH, UNIT, WPG, and WY. I am personally long CBL-E, CBL, CXW, GMRE, GNL, GOOD, IRM, MAC, RLJ, STAG, UMH, UNIT, WPG, and WY. This article is provided for informational purposes only. It is not a recommendation to buy or sell any security and is strictly the opinion of the writer. Information contained in this article is impersonal and not tailored to the investment needs of any particular person. It does not constitute a recommendation that any particular security or strategy is suitable for a specific person. Investing in publicly held securities is speculative and involves risk, including the possible loss of principal. The reader must determine whether any investment is suitable and accepts responsibility for their investment decisions. Dane Bowler is an investment advisor representative of 2MCAC, a Wisconsin registered investment advisor. Commentary may contain forward looking statements which are by definition uncertain. Actual results may differ materially from our forecasts or estimations, and 2MCAC and its affiliates cannot be held liable for the use of and reliance upon the opinions, estimates, forecasts and findings in this article. Positive comments made by others should not be construed as an endorsement of the writer’s abilities as an investment advisor representative. Disclosure: I am/we are long CBL.PE, CBL, CXW, GMRE, GNL, GOOD, IRM, MAC, RLJ, STAG, UMH, UNIT, WPG, WY. I wrote this article myself, and it expresses my own opinions. I am not receiving compensation for it (other than from Seeking Alpha). I have no business relationship with any company whose stock is mentioned in this article.